When business insurance first became popular, Ocean Marine Insurance was a commonly purchased policy. An Ocean Marine policy is meant to protect cargo shipped via the sea. Those looking for Transport Liability Insurance specific to marine cargo should consider this policy. As times changed, so evolved shipping and insurance needs. If your business is shipping cargo on land, we’d like to introduce you to Inland Marine Insurance. The insurance that protects your cargo after it leaves the ocean. 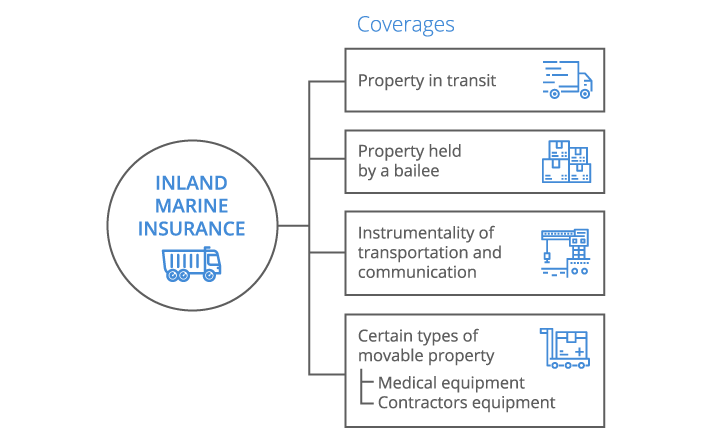 Commercial Inland Marine Insurance, from a very basic level of understanding, covers cargo that spends very little time, and sometimes no time at all, on the water. In today's world, we ship to all kinds of places instead of just the major port cities. That means that goods are transferred to trains, planes, barges, and many other forms of transportation to get them to their final destination. If shipping companies only wanted to protect items that were transported on the water, they would be fine with Ocean Marine Insurance. However, to protect the cargo the remainder of the way, this type of insurance is important to have. It may seem as though there should be a policy that covers both ocean and land transportation at the same time. If you use both methods of transporting your goods, then it might even seem redundant to purchase both policies. Unfortunately, if you want protection on both, then you need to have both Ocean Marine Insurance and Commercial Inland Marine Insurance. A Commercial Inland Marine policy doesn't just protect the goods that are currently in transit. It protects the goods even while they are not moving during the shipping process and sometimes during the delivery process and beyond. Do I Need Inland Marine Insurance? Commercial Inland Marine Insurance covers items that are transported off of the sea. This can include train transit, air transit, and much more. It cannot prevent someone from suing a company if items are lost but it can protect the company from losing a lot of money to cover the loss. Transit Coverage for transit companies that deliver for their clients Covers items while in transit. Commercial Computer Coverage for commercial businesses with high technology assets. This coverage provides protection for all of your commercial computers, laptops, and servers. Bailee's Customer This coverage is designed to protect a client's property while it is in the Bailee's care. Coverage for when the property is not currently in transport but is with the Bailee and still technically in your possession. Motor Truck Cargo This coverage in the policy will protect the goods of your client while you are delivering them. Coverage when you are delivering the items, not transporting them. Builder's Risk Coverage during a construction project that protects the structure as well as the construction materials. This type of coverage is ideal for contractors and builders because it protects materials and structures during renovations or even construction projects. Installation Floater Coverage for materials you are delivering until they are given to the recipient. This covers materials from a trade from the moment you load them for transport until they are accepted, installed, or put to use. Exhibition and Fine Arts Coverage for highly valued art and exhibitions. This is coverage for companies in the arts industry. It covers items on display and keeps them protected while on loan, in transit, and on exhibition. Contractor's Equipment Coverage for construction tools and machinery. This coverage is popular with contractors because it protects tools and machinery at job sites, at storage yards, and all points in between the two locations. What Does Inland Marine Insurance Not Cover? Inland Marine Insurance is a broad type of insurance, but it does not cover everything. It is important to keep in mind that every policy is different when looking for the right insurance. Just because one policy covers something does not mean another policy will. This is because there are different types of coverage and limitations. What Are the “Limits” on an Inland Marine Insurance Policy? The limits on this insurance will vary based on the coverage you have and the limits you have. 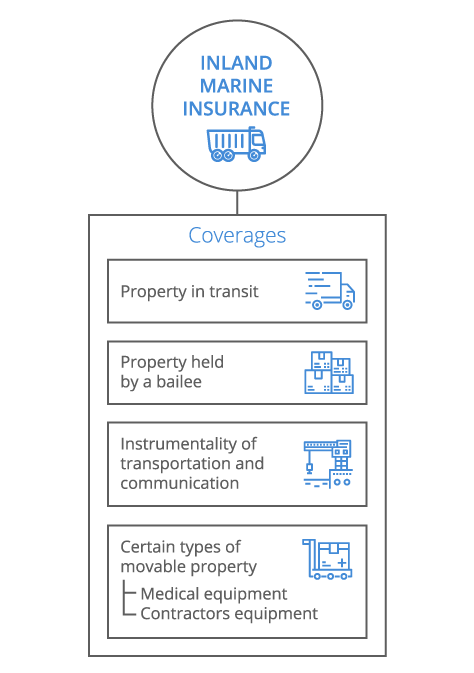 Keep in mind that Commercial Inland Marine Insurance is a customizable type of insurance based on the type of business you are in and how much coverage you need. There are no current state requirements for this insurance which means you can get as much or as little protection as you want for your business. Since this insurance type is not a required insurance, nothing is forcing you to get it. However, it is a broad kind of insurance which means it can provide a lot more coverage for your business. It covers things that Ocean Marine Insurance does not cover and can help fill in the gaps with protection that can save your company a lot in potential losses. The cost of a Commercial Inland Marine policy will depend on your business size, the amount of protection you want and any state required limits you’ll need to meet. The best way to to get a true idea of cost is to get a quote specifically for your business and to review it carefully to make sure all of your concerns are truly covered. Filling out Commercial Inland Marine Coverage forms will help start the process.